Roman shades provide a neat and functional way to control light filtering with a method that's as ancient as stone pillars. The build of Roman shades means that they can present interesting interior design additions to both homes and office spaces. Want to know more? Agoura Hills Blinds & Shades will happily consult you on these wonderful window coverings. Ancient Rome was once considered the pinnacle of human civilization. Such a title meant that their civilization would probably originate various things that would stand the test of time, or at least, would outlast them. While they didn't invent the aqueducts (it's a popular misconception that they did), they certainly did improve upon this water transferring system. The great Roman Empire has long since been razed and yet one of its legacies still remains. The roman shades. These compact window coverings are some of the most well-built and aesthetically pleasing shades that exist today. Quite an impressive feat, considering how ancient they are. Pulled all the way down, Roman shades don't necessarily look much different than other counterparts. They're still beautiful, and their fabric can come in various colors and styles. But the design intricacy of these Roman style-coverings as pleated window shades becomes evident not during the closed position. 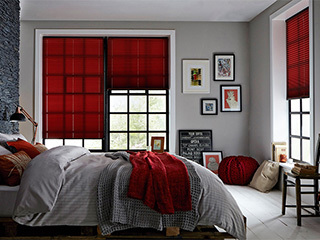 When these shades open, the fabric becomes neatly folded into equal sized pleats, which makes for a very aesthetically looking decor enhancement that tends to catch the eye very easily. Every window treatment options have pros and cons, and Roman shades are no different. The'yre a very flexible way to control sunlight exposure, and are great for offering privacy. After all, we're dealing with a single piece of fabric, as opposed to connected slats. Of course, slats do offer a higher level of light control, but they're also more expensive. Another major benefit of Roman shades is their ability to provide some added energy efficiency, depending on the fabric. They're an excellent choice for smaller windows in particular. Whether you're looking to cover your kitchen, living room or bedroom windows, Roman shades make for an excellent choice. You can also custom fit them for your glass doors. Agoura Hills Blinds & Shades offers a five-year warranty on all our products, as well as a free consultation appointment that will help you choose from all sorts of design options. And let's not forget, motorized roman shades are also available! Your complete satisfaction is guaranteed. Contact us today.